All participants will receive a $500 Aetna Fellowship or the option to earn six graduate credits in English. Applications for Summer 2019 are due by March 18th, 2019. 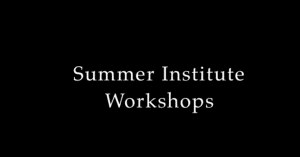 Click here to read the Summer Institute F.A.Q. Click above to find an archive of the booklets created by teachers after each Summer Insitute. The essays, vignettes, and poems collected in these booklets, chosen by their authors with the advice of the other members of their groups, represent a small sample of the writing produced by teachers during the Summer Institute.